From powerful Dysons to a classic Henry Hoover; we’ve rounded up the most powerful vacuum cleaners to keep your home dust-free. Hoovering has to be one of the more boring household chores and one of the trickier ones if you have a less than adequate vacuum cleaner. If your current device is a little lacklustre and failing to pick up anything from the carpet, then it’s time to invest in a new one. But before you go out and buy the first thing you see, there are a few things to consider that will help you get the most out of your hoover. What should you be looking out for when buying a vacuum cleaner? Firstly, consider the space you’re working with and frequency of your hoovering habits. Upright vacuum cleaners are the most common and they’re generally the most powerful, but can be heavy and tricky to manoeuvre around those hard-to-reach areas. However, with the likes of Dyson upping the stakes with their new roller ball technology, upright vacuum cleaners are still a hugely popular choice for many households. Canister vacuum cleaners, on the other hand, can make cleaning areas such as the stairs, under furniture and, well, pretty much anywhere, a whole lot easier. The downside to these is they’re a little bulky and can be difficult to store if you only have a small flat or apartment. If you struggle with the weight of a standard upright vacuum, or you’re simply too lazy to do the chores yourself, robot vacuum cleaners have taken the world by storm since the invention of the original Roomba. Although not as powerful when it comes to suction power, let’s face it – they are pretty cool, and require no physical exertion from you. But when budgets won’t allow for your own personal cleaning robot, a cordless vacuum is a nice compromise. They allow us more freedom when cleaning, which means less chance of getting tangled up or stretching to reach the other side of the room. A decent vacuum cleaner can cost anything between £80 to £500, with robot vacuum cleaners costing up to £1,000. It’s better to spend a little more on a vacuum that provides excellent coverage and suction, rather than spending a moderate amount and ending up with something that simply pushes dirt around the floor. The right vacuum cleaner for you will have a capacity large enough so that you don’t have to empty it so frequently, but be compact and flexible enough to manoeuvre around your home. Dyson’s latest model makes our number one spot for the best vacuum cleaner due to its powerful and efficient cyclone that aims to offer their best suction power and largest bin capacity yet. This model is slimmer and more compact which aims to appeal to those who find upright vacuums to be a little too bulky and heavy for their liking. Customers who own the Dyson DC41 Animal are incredibly impressed with just how much dirt and dust this vacuum is able to remove, and say that the ball technology really helps get right to the corners and edges of rooms without the need to use an attachment or tool. It’s pricey, but this vacuum cleaner is perfect for all materials and will leave vacuum lines that make your carpets look brand spanking new. Those with allergies will be pleased to hear that this Philips canister vacuum cleaner features a HEPA filter which helps get rid of 99% of dust, pollen, pet hair and any other particles from within the air when hoovering. Owners of this vacuum noticed a significant improvement in the quality of the air in their home when using the Philips Ultimate Bagless Cylinder vacuum, and found the 3-in-1 nozzles to be extremely helpful when getting to those hard-to-reach areas such as the stairs. Users did find that the powerful suction makes hoovering carpets somewhat of an upper body workout, but overall it’s fairly lightweight and makes for one of the best vacuum cleaners for hardwood flooring. If you’re looking for one of the best cordless vacuum cleaners, then the Dyson V8 is a strong contender. This is a powerful and versatile vacuum that allows you to roam freely without being restricted by a long cable, and unlike other cordless vacuums, this one has a handy charging station rather than a charger which comes with cable (defeating the point of a cordless vac entirely). Users love not having to battle with cables when going from room to room, but say it gets a little heavy after a while, therefore we’d recommend this vacuum to smaller homes. The “on” button also needs to remain pressed in order for the vacuum to work; something users find tricky to get used to, but certainly not something that puts them off. Check out the full Dyson V8 review here for more info. The Roomba is the original robot vacuum cleaner and boy does he make an impression. This little fella can be set to automatically clean your floors up to 7 days a week, with a battery time of up to 2 hours. This robot vacuum cleaner can be linked up to an app on your phone (may require some patience if you’re not that tech savvy) so that you can get the vacuuming done even when you’re out of the house, making it perfect for those with busy lifestyles. Customers who have their very own Roomba say that they are incredibly intelligent and efficient; rarely getting stuck or going rogue like some other robot vacs have been known to do. Its disc-shape makes it easy for him to navigate his way around corners and underneath furniture so you don’t have to lift a finger. For more like this, check out the best robot vacuum cleaners. This upright vacuum cleaner is sleek and powerful, with a handy lift-away pod that allows you to get to those hard-to-reach areas with ease. It also features snazzy (albeit a tad unnecessary) headlights, which illuminate any dirt underneath furniture for a much more thorough clean. This is also one of the best vacuum cleaners for allergies as it features a HEPA filter which gets rid of up to 99% of particles in the air, leaving your home clean and fresh. Customers find it very lightweight and easy to manoeuvre but find it to be more effective on carpet than on hardwood flooring. For homes with pets, the Miele Complete C3 has got you covered. Customers are amazed at how powerful this vacuum cleaner is, so much so that it leaves carpets looking reinvigorated by lifting the pile so they look good as new. It’s fairly lightweight and quiet when in use, with a range of different tools and attachments that make cleaning anywhere a breeze. The hose is a little bulky and can be difficult to control on the highest setting, but overall it’s easy to store and leaves your carpets with professional looking results. Henry’s had a makeover and now he’s cordless. This reliable classic Numatic Henry Hoover is a friendly face we all know and love; with great suction power and a large capacity for cleaning bigger areas. This vacuum cleaner now also features 2 speed settings to help you achieve greater results. You’ll get 30 minutes of battery life which may not seem like a lot, but with its one-click battery swap, you can quickly pop in a new battery for bigger jobs and then charge him up again when you’re done. Customers would have liked to see the new Henry with a slimmer figure, but overall they cannot fault him for his excellent coverage and ease of use. This is a great little vacuum cleaner for getting to those awkward places and particularly for cleaning the car. 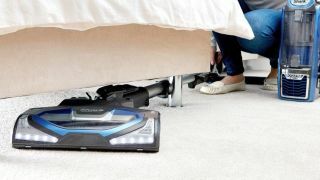 Owners of this vacuum say it is very powerful and great at getting into all the nooks and crannies, but battery life is only 15 minutes so you have to be quick! It’s lightweight, making it easy for anyone to use and is ideal when you don’t want to drag to main vacuum out for a small job. Users think it’s a bargain for the price, making it one of the best handheld vacuum cleaners on the market today. If your carpets need a deeper clean, check out this guide to the best carpet cleaning machines to transform your grubby interior in an instant.